What Makes Aluminum Gutters So Special? It is easy to think of a good home as one that comes complete with luxurious amenities like saunas and heated swimming pools. But like most homeowners will tell you, a good house features seamless roofing systems complete with gutters that hardly ever fail. That’s why setting aside money for gutter repairs and installation is always a smart move. Before looking for a contractor who specializes in eavestrough in Oakville though, it is important to learn a thing or two about aluminum gutters, which stand out as the best option in the market. Just what makes them so special? This is where the aesthetic appeal factors come into the picture. Aluminum gutters come in a wide range of colors, making it easy for one to choose a gutter color and even design that can match different house designs. It gets better with the fact that aluminum gutters are also not prone to bleaching which occur as a result of overexposure to the sun. Most gutters will force on to incur extra painting expenses if one is to end up with a gutter color of his or her choice. This is usually a waste of time. The painter may or may not get the job right, another setback that can delay one’s gutter repair or installation project. Gutter cleaning is not an easy job. It is unfortunately, a task you cannot avoid. With an aluminum gutter however, the task becomes simple and manageable. You won’t have to worry about priming or even painting. The most you can do is schedule maintenance of the gutter system not to repair anything but to get rid of the usual leaves and other roof debris that accumulate in gutters from time to time. Unlike copper and steel gutters, you don’t require any soldering of joints. This makes it easy for one to install the gutters. It also guarantees stability. It is also important to note that unlike other gutter materials, aluminum gutters do not succumb to effects of thermal expansion. As a homeowner, you will always want to make the smartest choices when it comes to your remodeling choices. If you want to strike a balance between adding value to your home and staying within your budget constraints, aluminum gutters are the perfect choice. Currently, aluminum gutters are one of the cost effective gutter systems on the market today. This explains why many people are turning to them these days. While steel gutters cost about twenty dollars per foot, the price of aluminum gutters range between four to eight dollars per foot. Leaky gutters can be annoying. You fix a leak and before you know it, another leak occurs somewhere else. The cycle continues until you get rid of the leaking gutters. Replace the gutters with aluminum gutters and just like that, leaking gutters no longer become a recurrent problem. That’s simply because of a special sealant that comes along with all aluminum gutters designed to prevent leaking. There is nothing one can do about inclement weather conditions. They come and go as they please, leaving behind a trail of havoc. Gutters often suffer the most. Not so with aluminum gutters. They withstand both hail and snow. This means they do not thin at all. Aluminum gutters are one of the gutters that offer the most customizable options in the market today. This makes it very easy for gutter repair and installation experts to choose a gutter design that can match the roofs that they need to work on. With aluminum gutters, homeowners will never have to worry about mis-matching gutters with their exterior building façade! The roof is to a house what shoes are to a man. Well, it is the first thing people notice when they look at a house. It therefore goes without saying that a roof should always be aesthetically appealing. But over and beyond that, the roof should at all times be functional. That is where gutters come in. A well designed roof should always have a good gutter system. Unfortunately, there aren’t so many expert gutter repair contractors specializing in eavestrough in Mississauga. This does not mean though that the good ones are non-existent. They are there, you just have to look for them in the right places. But before then, just how do you know you have a poor gutter system? Read on to find out. Clogs are inevitable especially in homes with traditional gutter systems. This becomes worse when the configuration comes without a trough cover. Frequent clogs cause water to overflow leading to problems with on the foundation. When you reach a point where you always experience frequent clogs, you might consider changing the design of your gutter. When the foundation of your home is exposed to water, serious issues begin showing. Most of the times, these issues will begin with formation of cracks either on the exterior or interior of your foundation. When you come across any cracks on the foundation, it is an indication that the water from your gutter is being let down into the basement. A well-designed gutter will effectively allow water to flow away from your home naturally. 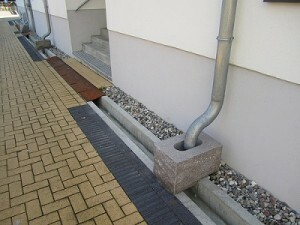 However, a poor design that is angled too close to your home may lead to formation of a pit under your downspout. When this happens, gutter extension can be used to correct the problem. Most homeowners do not give much attention to the roof gutters around their houses until the gutters start clogging or overflowing. While these may seem to be very serious issues, minor things like dryness at the end of the gutter system may also be an indication of problems with your gutter system. This happens mostly when the water is escaping through other areas for example a hole. If you notice streams of water that seem to be pouring down from the middle of your gutters, it’s likely that your gutters has a leak. Sometimes it is very hard to notice the water that may be dripping down the sides of your home. Fortunately, there will be stains or even growth of mold to remind you of the teething gutter problem. Clogging stands out as one of the main reasons why gutters overflow. However, if you have recently replaced your gutters but still notice this problem, it may be due to a poor gutter design. You can have a professional check the size of your gutters to ensure that they are the right size. Your gutter design should also be inclined appropriately for ideal flow of water. Water always leaves behind stains anytime you have a faulty gutter. You will notice the stains on the sides of your home which will eventually cause peeling paint. This is more often than not, a result of incorrect gutter size or wrong placement. Be keen on what you see on your home’s foundation. Water erosion anywhere near the foundation is always a sign that your gutters allow moisture to escape through downspouts. This should not be the case at all. Moisture should instead, flow through the downspouts. Gutters have a profound and imperative effect on the lifespan of any roof. A good gutter system will save you lots of cash that would have otherwise been used in repairs. That’s why it is always a good idea to hire the best gutter repair and installation contractors you can find in your local area. When building a house or a building for that matter, the selection of gutter sizes has to be considered. Among some of the factors to consider while selecting the size of eavestrough in Oakville could be but not limited to the following; efficiency and effectiveness of the gutter, the material used to make the gutter, the cost of the gutter, the shape, size and colour of the gutter. Here, the selection is based on how effective the gutter is, in performing the required duties. One must choose a gutter that is able to keep away unwanted materials and allow a free flow of water through the channel, hence harvesting more water for use and clean water for that matter. The gutter should be able to withstand almost all forms and types of weather in that it cannot be destroyed by too much sunlight and also too much rainfall. This is also a rather important factor to consider while purchasing a gutter, so as to avoid replacing the gutter after every seasonal change. The material should be strong enough to withstand both strong sunlight and too much rainfall. There are a number of materials used in making gutters, ranging from seamless gutters, mostly made from aluminium materials or content, copper and stainless-steel gutters and also wooden gutters, which are no longer used frequently due to their heavy nature and also tend to be more expensive to purchase. There are a wide range of gutter systems in the market. As a buyer, one should look for a gutter that suits their needs and seem to be able to perform the required need. Also, one that is affordable in pricing. When calculating how much the gutter will cost, you should be able to include the charges of installation in order to get the right estimate of how much the whole project will cost. Among other things to consider is the shape of the gutter. Might not seem important but it sure is. There are two common or basic types, that is, the K-Style gutters and the Half-round gutters. The K-style gutters are mostly flat on both the back and bottom areas and usually have decorated shapes on the front sides, either ogee or curved shapes. The Half-round gutter on the other hand are half-round tubes, often found in archaic or historic homes or structures. When you are considering to buy a gutter, the colour also matters as it has to go hand-in-hand with the colour of the structure in place. There are a wide range of coloured gutters in the market for one to choose from. Brightly coloured gutters tend to reflect light away therefore keeping the walls of the building or house cool, while dark ones on the other hand tend to retain a lot of heat which is also retained by walls of the houses or structure. The above are just among the few guiding factors to consider when selecting or choosing the right gutter for a house or a building. Once you pick the right gutters for your home, you need to work with an experienced gutter installation company to ensure they are fitted professionally. Wrongly fitted gutters do not perform and this can lead to costly damages to your house’s exterior walls and landscape. Also, you should have your gutters regularly maintained to ensure the stay in good condition for a long time. In case of damages, instead of replacing your entire gutter system, you should call in the experts to repair the damages. Well maintained gutters can last for years, so it’s a great investment you should consider. Climatic change can be defined as the change in the average weather conditions. Climate change is influenced by a number of factors like; human activities, volcanic eruptions, solar radiation variations to the earth surface, movements of plates tectonics on the earth surface and also biological process can cause climate change. Climate Change has effects on several things under the sun and some of them, as tiny as they may appear can affect the normal functions of our day to day activities as human beings. As mentioned before, climate change also affects gutters placed on ours houses and buildings in a numbers of ways as highlighted below. The size of gutters matters when it comes to climate change. This is because, they might have been made in a way that they cannot handle a lot of rainfall or downpour, especially depending on the condition or size of the gutters installed. Due to this, the gutters might start wearing out faster if there are harsh weather conditions for a long period of time. Prolonged downpour and rainfall can cause debris and other larger dust particles to collect into one area of the gutter especially around the edges or the downspouts areas. This alone can cause a large amount of water to dump on the particular area and cause the debris to damage the gutter or the surrounding area of the gutter. Large amounts of debris can also cause limited amounts of water passing through the gutter hence flooding of the surrounding area or even the house. As we know, different changes in climate brings about storms, which can come with all types of dust particles that eventually settle in the gutters especially if the gutters are fitted without a sieve. Where water is not flowing in the right manner through the proper channels, that is, the gutter installed and down through the downspout, away from the house, the clogged water along the gutter will eventually pour over the gutter hence creating a flood around the home or even inside depending on where the gutter is having a clog. As much as climate change can be a negative factor on gutters, it also becomes a positive factor. How? When there is heavy downpour or rainfall, one can easily tell and know the problematic areas of their gutters and have actions taken on the affected areas only, without having to un-install the whole gutter system. In the event that the overflow is more towards the centre of the gutter, it may mean that there aren’t enough downspouts to flow the water freely, hence more can be added. Or, if there is a clog in the gutters, or the gutter is damaged or has sagged in the particular area that means it needs some renovations done on it. Alternating heavy downpour or rainfall and too much sunlight brought about by climate change can cause rust and corrosion on the gutters. This happens especially if they are made from iron like materials. This rust or corrosion when it comes to contact with water elements, it produces a chemical that can be harmful to someone’s health when consumed. Though climate change is here with us to stay, it is upon us to have a routine maintenance check on the gutters installed in our houses and homes to avoid the likelihood of the above occurrences and mitigate them in due course. If you require any repair or maintenance services regarding your eavestrough in Mississauga, contact professionals to get the job done right. 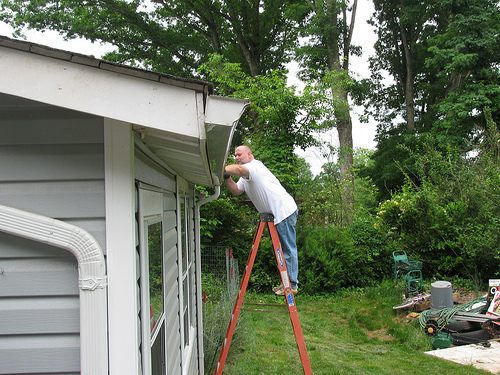 Remember, never try to install or repair gutters by yourself, especially if you do not have any prior experience. Are Continuous Gutters Better Than Sectional Systems? Gutters are available in two broad categories; those with seams and without seams. There is always a debate on which ones are better and homeowners are sometimes are stuck on which ones to choose for their homes. Seam gutters also known as section gutters are fastened and joined together at seams. On the other hand, seamless gutters also known as continuous gutters do not have seams in between. Seamless gutters are formed on site from specialized gutter machines in order to get the right fit. Recently, more homeowners are installing continuous gutters at their homes than sectional gutters. Let’s take a look at why seamless gutters make a better choice than sectional gutter systems. Seamless gutters give a kind of uniformity which makes them quite appealing. They are custom designed which means that they are set according to the exteriors of a home. They give a more cleaner finish which makes a home look more organized. A homeowner can hire a company that specializes in eavestrough in Toronto to install seamless gutters that match their home’s exterior style and colors to add a lasting appeal to their homes. One has the option to install steel, baked-on enamel or aluminum gutters. All these materials last for long and marinate the aesthetic appeal of spaces. As mentioned earlier, seamless gutters have no joints in between meaning that chances of clogs, blockages or leakages automatically decrease. Also, dried leaves, twigs and debris will not accumulate in between the passage and this means less maintenance unlike for sectional gutters. Clogs and blockages in gutters cause more serious problems that require one to hire professional maintenance services. Installing seamless gutters can save a homeowner a lot of money by avoiding these maintenance services. This is something a homeowner needs to consider as a long lasting solution to common gutter problems. When it comes to sectional gutters, it does not matter whether you use good quality systems. Eventually, these systems start leaking because water makes spaces in between the joints with time. This is a problem you will not experience with seamless gutters. Seamless gutters are investments that make more financial sense than sectional gutters. Seamless gutters are custom designed and add an aesthetic appeal to a home therefore, they add more property value. Compared to sectional gutters, seamless gutters are a bit costlier in price but they surely add better value to a home. Keeping a lawn pristine and green is a matter of pride. However, if you do not have an effective gutter system, you will end up with a growing puddle of standing water in your yard. This not only affects your landscape but standing water can eventually affect the integrity of your home’s foundation. Also, when standing water is left unattended for a long time, it becomes the breeding ground for mosquitoes and becomes a symptom of larger problems. Seamless gutters are designed to smoothly guide the flow of water and debris from your roof during rainy seasons. The water is then directed away from your exterior walls and foundation to the drainage systems. If you are looking to install, maintain or repair seamless gutters, always contact professionals to get durable solutions. Before installing seamless gutters, consult a professional company that specializes in eavestrough installation and come up with a design of your gutter system that will compliment your home’s exterior. When it comes to routine gutter maintenance, it is best to let the professionals do the job. 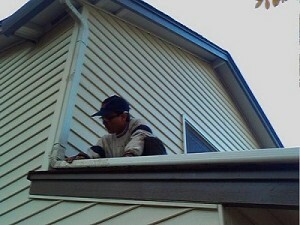 Professionals take time to carefully check your entire gutter system to ensure that it is in perfect working condition. Also, they are well equipped to take care of any potential problem in the system before it gets worse. During winter, gutters develop a lot of functionality issues ranging from clogs to ice dams. Such issues prevent free flow of water from the gutters eventually pulling gutters downwards. The good news is that there are steps you can take to make your gutters more effective in the winter months. The following are tips you should follow to ensure your gutters work better during the winter season. The best way to ensure that your gutters remain functional during the winter season is to install gutter guards. Have them installed by a company that specializes in eavestrough in Oakville. Gutter guards are designed to go over the top of gutters to keep debris such as sticks and leaves out while allowing water to flow through the top. They prevent gutters from clogging which can lead to other serious problems later on. It is unfortunate that many homeowners take it upon themselves to install guards without professional help. They end up installing guards that are either too small or too large for their gutters which make them ineffective. To get the best results, always hire a professional to install your guards. 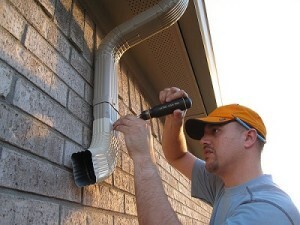 Even with gutters guards on, you still need to clean your gutters every now and then. Dirt, mud and other debris end up making their way inside guards and if not cleaned out, they can cause clogs. The best time to clean your gutters is during the spring season or right before winter. This way, you get rid of any debris that has accumulated in the system to allow free flow of water. Take time during the rainy season to check how water is flowing through the gutters. If you find that the water is not flowing as it should, that should be a sign that there is a blockage in the system. Most people don’t think about insulating their attics. However, insulated attics help to keep the roof warm during winter. A warm roof will help ice and snow to melt faster which then allows the run-off to flow into the gutter. Snow or ice will not slide into the gutters which then avoids the formation of ice dams. Just before the winter months, you can have a professional reinforce your gutters to help them hold up better. Using gutter brackets or bracing hardware, your gutters can be reinforced to help them support and hold more weight. This prevents your gutters from pulling away from your roof or home. 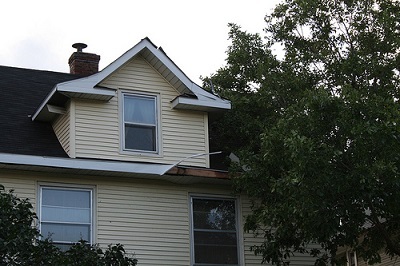 When gutters pull away from the roof, they can damage the siding of your home. Another way to keep your gutters more effective during the winter months is by adding heating elements to the system. Heating elements and cables help to melt snow and ice that form within your gutters. Heating elements will prevent the formation of ice dams within the trough hence, protecting your gutters and roof. If you live in areas that get extremely cold during winter or experience heavy snow falls, investing in heating elements is a priority if you want to avoid spending much in gutter repairs. Apart from playing the important role of carrying water off the roof of a home and discarding it away, gutters also help to protect your sidings and the integrity of your home’s foundation. Whether you need gutter repair and maintenance or you are in the market for new gutters in Oakville, always look for a reputable company that specializes in eavestroughs. Make sure that you rely on a professional to take care of your gutter needs for durable solutions. The amount and size of snow that winter brings each year changes. Notice that as the years go by, snow becomes heavier and thicker than the previous ones. If you have ignored your gutters before winter comes, expect that the snow will bring possible winter gutter damage to your roof. This can prevent melted ice from flowing freely through the downspouts, which in turn, will result to other problems. The good news is you can actually prevent winter gutter damage to your roof through the following tips. It is important to prepare your gutters right before winter comes. Make sure that you remove all sorts of debris that may have lodged into them. This is very important in keeping the gutters away from ice build ups and ice dams. At this time of the year, expect that leaves may have clogged the gutter. Remove all of them from your roof and gutters prior to the onset of winter. Make sure it is working. Remember that the roof insulation can help melt snow that falls on your roof. If it does not work, there is a big chance that it will impede the flow of melted ice which will definitely damage your gutters before you even know it. You have to make it a point that heat does not escape from your home because if it does, it is a sign that the insulation is damaged. This will help melt the snow that will drop on your roof. This may require some amount of cash but you will definitely realise that this is a worthy investment. It will not just protect your roof but it will also be a foolproof solution to get rid of winter damage on your gutters. An added bonus is the fact that rooftop heating cables will add value to your home should you decide to sell it in the future. Make sure that each piece of shingle is still intact. You need to check every single one of the shingles to find out if they are firmly fastened to their respective places or not. 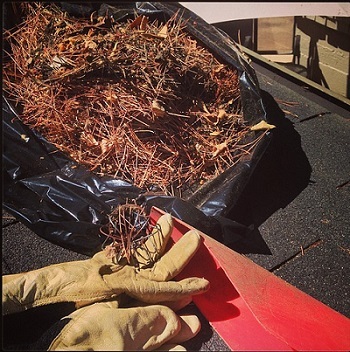 Loose shingles will definitely be a problem to both your roof and gutters. Just a single shingle that is not fastened in place will allow the cold temperature to seep into your home. Have the shingles repaired at once if you notice any fault in them. Nobody is ever sure of how much snow will fall every single day during winter. Heavy snow fall will definitely put more weight on the roof causing it to buckle down. A gutter guard will help prevent this from happening. A gutter guard can also help support the load capacity of your gutters thus reinforcing and strengthening the structure which will help in taking heavy snowfall. Buy one if you do not have any. A roof rake will help you remove snow from the roof and will protect your gutters from winter damage. Make sure that you use the roof rake properly or else you might end up scraping the surface which can damage the material. You definitely would not want the roof rake to be the cause of your gutter’s damage. Homeowners like you know very well that each part of your home serves a certain function. The living room is great for get-togethers with family members whilst the dining room will be good for eating meals. The bedroom, on the other hand, is the perfect spot where you can relax after a hard day’s work. These rooms are with no doubt very important to provide the comfort that you need from a home. Additionally, each room has its components and all serve their functions accordingly. Aside from what you actually find inside your home, there are also certain components of the home that are important in protecting it in order to keep it well-maintained for a long time. One such component is the eavestrough. It is sad to note, however, that this component is often overlooked and is usually ignored during home renovations. Since an eavestrough is crucial in protecting the home against water damage, it has to be updated as well. Here are some other reasons to get your eavestrough updated. Eavestroughs, as mentioned, are placed in order to prevent water from seeping into your home. These can also prevent the possibilities that water may gush off from the roof moving to your front porch. The front porch, as we all know, is your access to get inside your home. When it is flooded because of a malfunctioning eavestrough, you will surely get soaked even before you enter your home. Outdoor flood can be very hard to deal with. What more if it enters your home? In order to prevent that from happening, you have to make sure your eavestrough is not too old and is still working in its optimal condition. Remember though that years of hard work may have already put its toll on this component. Upgrade your eavestrough once you have noticed that it no longer effectively diverts water away from your home. Heavy downpour of rain can result to a muddy backyard. When water gushes off from an old and out-dated eavestrough, expect that mud can splatter and splash on your home’s exterior. Prevent the big mess that gushing water can create by making sure your eavestroughs are updated. Puddles of water gushing from the roof and passing on an improperly working eavestrough will not just create mud that will splash on your home’s exterior. It can also breakdown your concrete driveways. This will then result to cracking of the surface which will mean additional cost on your part since you need to have this corrected as soon as possible. Prevent additional costs that are heavy on the pocket by upgrading your eavestroughs. Fascia adds aesthetics to the home by covering specific portions of the roof’s edge. It is installed to create a barrier against rainfall while also protecting it from inclement weather. When your eavestroughs are overfilled with water, there is a tendency that the water will reach the fascia. When this happens, the fascia will rot in no time which will require repair or replacement as well. Updating your eavestrough in this regard will mean doing some regular maintenance work on it. Gushing water from the roof can also affect your landscaping because this will lead to soil erosion and also create some holes or dips in your yard. When this happens, plants can easily knock over which will entail more effort to replant them on your part. These are but some of the obvious reasons to hire contractors to help with eavestroughing in Toronto. Protect your home by updating your eavestrough today! How Do Damaged Gutters Hurt Your Home? The main point is that leaking gutters cause water to pool and run on your driveway, foundation and other vulnerable places in your house, causing damage. A cracked foundation or soil erosion can cause foundation problems and your home may shift and these problems are notoriously expensive to fix. To fix these financial disasters, it is much more affordable and easier to find a company that performs repair for eavestrough in Oakville. There are a number of reasons why leaks can develop. With time, gutters wear down especially if they are not properly maintained. Another main cause for leaks can result from weather damage. If you have a gutter system that is built in sections, the seams used to hold the sections together deteriorate with time which causes leaks. Plastic gutters are not safe either. They get brittle with age developing cracks. Leaks usually take place where the gutter meets a downspout. If your downspouts start to leak, they can cause serious damage to your siding. A more complex problem develops when water start to run inside your walls due to leaks. Some leakages are not easily noticeable but if you find out that your basement is damp, that is a sure sign that it has developed a leak. You need to hire professionals to get to the root of the problem before the situation gets out of hand. At the first sign of a leak, never try to fix gutter damages by yourself. Contact a professional contractor who will help locate all the leaking spots and deliver the best solution. If you try to fix a leak by yourself, you can end up creating more damage to your gutters which can cost you thousands of dollars to repair the damages caused by water leakages. Furthermore, you will be putting yourself in harm’s way by trying to climb ladders if you are not experienced in matters concerning gutter repair. If you find that you keep repairing your gutters every now and then, it is a sure sign that you need to consider installing new gutters for your home! Is Your Home Exterior Well Protected From The Elements? Tasks such as cleaning cabinets, painting walls and doing interior design changes inside the home are often carried out by homeowners regularly. However, it is unfortunate many homeowners forget to take care of their home’s exterior as well. Your home’s long term “health” depends on maintaining your exterior regularly too. When you maintain your home’s exterior, you protect your home from the elements and keep decay, pests and moisture out of your home. The following are some of the important exterior maintenance tasks that are important for keeping your home in a great shape all year long. Over time, concrete can wear down and start cracking. Concrete sidings require periodic maintenance and filing to ensure the walls do not get damaged. Fixing small cracks in concrete is much easier and less expensive than when the cracks become bigger, and then you may have to hire professional help to fix the problem. Ensure that your walkways do no develop cracks and fill them immediately they start cracking. Cracked concrete does not look good so, you need to fix any cracks to ensure your home looks presentable at all times. Your roof and gutters protect your home and you need to make updates to ensure they keep protecting your home. Occasionally, take time to inspect the exterior and interior of your roof to find any signs of imperfections or defects. Also ensure that you inspect your gutters and check for any damages that may cause leakages. Leaking roofs and gutters let in moisture inside of your home and these issues should be resolved immediately. When you find issues on your roof or gutters, it is better to make repairs than completely replace them. However, if you find that your gutters have more severe damages, you need to look for a professional for eavestroughing in Toronto to install new gutters around your home. 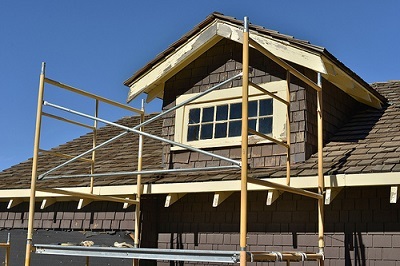 Painting the exterior of your home often helps to protect your home from the elements. Paint protects your home from moisture damage. You don’t need to paint every square inch of your house, you only need to do touch-ups to surfaces that require an upgrade. Be careful when picking out the paint to paint your exteriors. Find a colour that matches the current paint colours of your walls. If you find out that a particular area on your exterior walls keeps losing paint or peeling that can be a sign of a serious moisture issue. Have professional come check out the root cause of the problem and have it fixed to avoid more damages in future. Maintain your chimney by regularly inspecting it. Check the exterior walls for deterioration. Ensure that the rain cap is properly installed and that the top is sealed around the flue. To ensure that rain water does not seep inside your home, make sure that the protective screens are set in place. With time, water can damage the masonry if it develops cracks. Ensure that there are no birds or animals in the chimney to keep pests out of your home. Resolve any chimney problems for moisture protection and fire safety. Every now and then, you need to thoroughly inspect your foundation to check for any cracks. Any deterioration or cracks on your foundation is an indication of a serious problem. Cracks on your foundation may be an indication that your gutters are leaking. If you are not able to identify the root cause of the cracks on your foundation, you need to call in professional contractors to identify the issues and provide a solution.